The Global Volcanism Program has no activity reports for Roundtop. The Global Volcanism Program has no Weekly Reports available for Roundtop. The Global Volcanism Program has no Bulletin Reports available for Roundtop. The flat-topped, glacier-covered Roundtop is the easternmost and lowest of an E-W-trending line of volcanoes on eastern Unimak Island, 13 km SW of the village of False Pass. The snow and ice-covered edifice fills much of a 3-km-wide caldera that formed during the early Holocene. 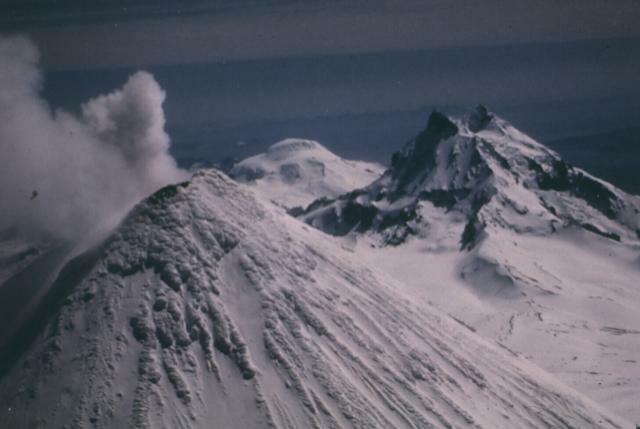 The caldera-forming eruption produced pyroclastic flows and a rhyolitic tephra layer that is widespread throughout the southwestern end of the Alaska Peninsula. A group of lava domes was constructed south of the volcano. No historical eruptions are known, but in the 1930's warm springs were found on its slopes. Carson E C, Fournelle J H, Miller T P, Mickelson D M, 2002. Holocene tephrochonology of the Cold Bay area, southwest Alaska. Quat Sci Rev, 21: 2213-2228. Miller T P, 1999. Newly identified early Holocene caldera-forming druption from Roundtop volcano, Unimak Island, Alaska. Eos, Trans Amer Geophys Union, 1999 Fall Mtg, abs V51B-17. There is no Deformation History data available for Roundtop. There is no Emissions History data available for Roundtop. 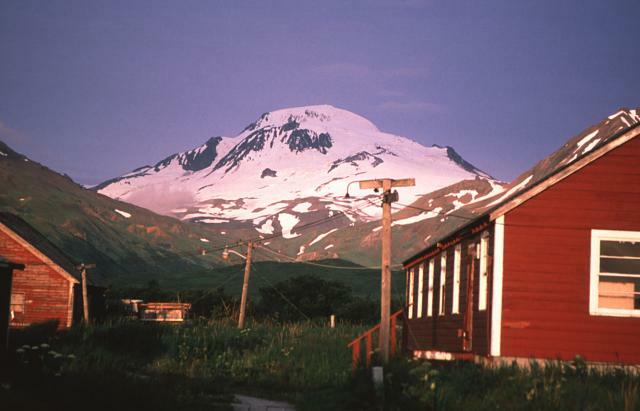 The flat-topped, glacier-covered Roundtop volcano, rising to the west beyond buildings of the village of False Pass, is the easternmost and lowest of an E-W-trending line of volcanoes on Unimak Island. Roundtop has produced Holocene pyroclastic flows, and a group of lava domes was constructed south of the volcano. No historical eruptions are known from the 1871-m-high stratovolcano. In the 1930s warm springs were found on its slopes. 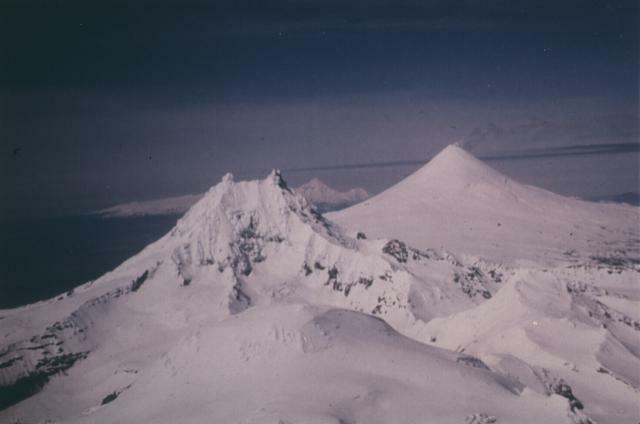 Photo by Game McGimsey, 1998 (Alaska Volcano Observatory, U.S. Geological Survey). There are no samples for Roundtop in the Smithsonian's NMNH Department of Mineral Sciences Rock and Ore collection. IRIS seismic stations/networks Incorporated Research Institutions for Seismology (IRIS) Data Services map showing the location of seismic stations from all available networks (permanent or temporary) within a radius of 0.18° (about 20 km at mid-latitudes) from the given location of Roundtop. Users can customize a variety of filters and options in the left panel. Note that if there are no stations are known the map will default to show the entire world with a "No data matched request" error notice. Large Eruptions of Roundtop Information about large Quaternary eruptions (VEI >= 4) is cataloged in the Large Magnitude Explosive Volcanic Eruptions (LaMEVE) database of the Volcano Global Risk Identification and Analysis Project (VOGRIPA).